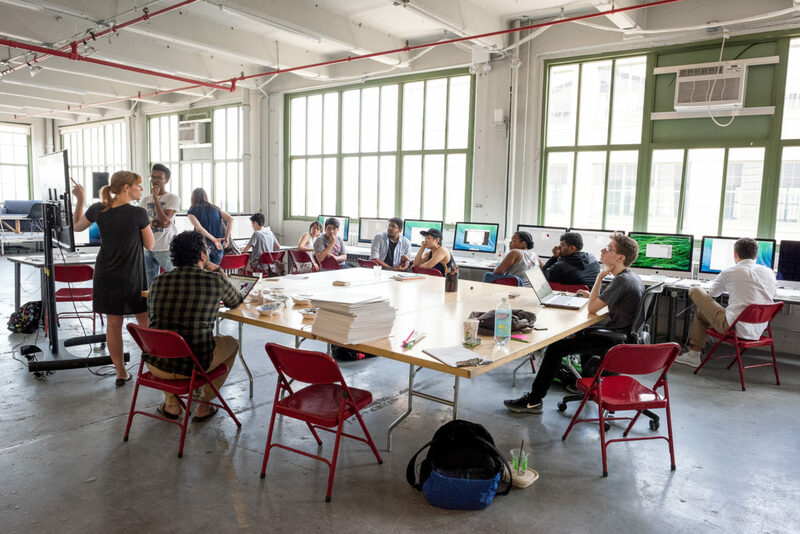 Digital Day Camp (DDC) is Eyebeam’s longest running program. DDC is an intensive, multi-week, youth arts and technology program for approximately 20 NYC public high school students. Through local partnerships, we recruit applicants from youth in schools underrepresented in STEAM programs to ensure a diverse range of ideas and backgrounds in each cohort. During DDC, students work alongside artist-educators and staff, engaging in lectures and hands-on workshops focusing on art and technology tools, careers in the field, and relevant social and artistic topics. We challenge youth and teachers to apply creative thinking strategies to help them develop critical, empowering and long-lasting relationships with technology. Each year we choose a theme for DDC that reflects both cultural trends and those in technology. Read more about the 2017 DDC session that focused on the topic of POWER (here) or take a look at our past DDC sessions below. DDC 2013 offered two areas of focus. The first, Game Craft, taught students how to develop their own digital game and create a wearable controller. The second, Beats, Rhymes & Hacking, taught students how to create their own electronic musical instruments and create their own music. DDC 2011, “Remapping.” Students interacted with the community, to engage with neighbors, and to interpret spaces. Workshops included model building, performance art activities, Photoshop/Illustrator basics, creating digital personas and more culminating in final projects – a unique 10’x10’ intervention/art/performance spaces nearby Camp HQ in Chelsea. DDC 2010 – Mobile App School. Students worked alongside experienced artists, designers, and technologists to design their own software application for the mobile platform. Students researched cell phones as tools for creative interaction, learned how to create graphics for mobile devices, and organized all their great ideas into one collaborative mobile app proposal. DDC 2009, Creative activism in an urban environment. Students worked with urban planners, software designers, activists, video artists, and even a couple of activist gardeners to dig a little deeper into the fabric of our city, to learn more about how we can use art and technology to change it for the better. DDC 2008 theme echoed that of Interactivos? : Interactive art and technology and the tension between “real” and “fake”. DDC 2007, Public interactions and street art. Participants studied the techniques, politics and groups involved in executing such projects, and learned about the practice and theory behind participatory actions, art, and activism. DDC 2006, Biotechnology. Students studied the fundamentals and ethics behind biological research (ie animal testing, germ warfare, bacteria and vaccines, dna, food growth and nano-technology) and green design, including the politics and groups involved in executing such projects. DDC 2005, Significance and history of the uniform. Students learned fundamentals of fashion and design, including the politics surrounding uniforms. Students learned basic circuitry and physical computing incorporating such components as light and sound sensors, LED tags and switches into the uniforms that, as teams, they were challenged to prototype. DDC 2005 concluded with a fashion show and exhibition of the uniforms developed during the 3 weeks of the program. DDC 2004, Urban renewal projects. Students studied the fundamentals of urban planning and design, including the politics and groups involved in executing such projects. DDC participants learned about game design and theory in order to develop interactive projects related to the Highline project. DDC 2003, Art activism. During the course, participants partnered with local activist artists and collectives. They used a variety of software and hardware applications in order to heighten public awareness about specific issues relevant to their lives and developed these concepts in three-tier communication campaigns utilizing blogs, contagious media and guerilla broadcasting (use of phones with audio/video capabilities and community access television networks). DDC 2002, “Building for the Void” investigated architecture, public art, and memorials in contemporary society and was influenced by the September 11th attacks and its impact on the city’s collective consciousness. Participants learned 3ds max, 3-D printing and were taught by local architects, new media artists and technologists with a curriculum focusing on the ethics of designing and building for sensitive topics and public spaces. DDC 2001 explored sound mixing, digital music and sound composition, along with the fundamentals of radio documentary interviewing styles. Students created interactive interfaces for sound files of mixed interviews and music generated during the three week program. Tools were taught in conjunction with a curriculum about censorship and intellectual property rights. Sound artists and DJs from New York City as well as technicians from sound organizations provided lectures and professional critiques. DDC 2000 was an all-girl program designed to encourage media literacy to help provide access to art and technology tools to a statistically under-served group. The participants were paired with professionals from Oxygen Media, in addition to volunteers from Pixar Animation Studios, MTV, MTV Networks, and Cyber grrls, to discuss media literacy and the female image in the media today. Teams created an original, digital public service announcement about a relevant social topic using digital video cameras and desktop digital editing equipment.